In collaboration with Michael Phelps and Bob Bowman, we set out to develop a line of swim equipment that allows you to get the most out of your training sessions and reach your peak performance in competition. All of our swimming caps and racing caps are FINA approved so you're always race ready. Our swim snorkel, short blade swim fins, and strength building swim paddles are ergonomically designed to maximise comfort and stability so you can stay focused on your swim, not your gear. The MP Swim Bag is a durable bag that keeps all of your swim equipment organised on and off the pool deck. Our Short Blade Swim Fins will help you build true swimming-specific leg strength whilst improving your kicking technique, body position and ankle flexibility. 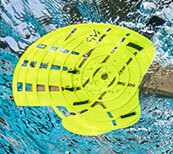 Swimming Hand Paddles are designed to build your strength by adding resistance to your stroke. They also encourage correct technique by forcing you into a proper pulling position. Use one of our Swim Bag options for easy storage and transportation. 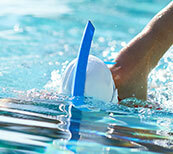 We have Swimming Backpacks or Mesh Swim Bags which are both big enough for all your Swim Gear.